I’m always looking for the best packing list. My Packing List is a great planning tool for female travelers. The 3 Travel Essentials Lists are Female Travelers Packing Lists, Travel Packing Tips & Travel Planning. Create your best packing list by country and seasons by using these travel tips. Pay attention to your basic categories or Travel Essentials. These Travel Essentials are your most essential belongings to bring such as adapters, documents, tickets, basic clothes in a single color palette, a backpack, and electronics. You can’t leave home without the travel essentials. Tip 1: Pack then remove at least three items before you go. Let’s call it, ‘Kate’s Travel Rule.’ I use the rule, and still, I over-pack. Tip 2: Your packing list should follow and include these simple things, clothing (one color plus black and white), accessories, toiletries, media equipment, power adapters, tickets, money, credit cards, and documentation. Tip 3: Make a Packing List based on the country and season. The most critical Packing Lists tip I have is to consider the country and culture before you pack. Remember to check the weather, and the season when packing. Putting these two factors together will help you. Think through what you will need to bring. Then, take a cell phone photo of all your items laid out on the floor. Look at it. Did you forget anything? Perfect you are ready to pack your bag. Check out Kat’es Travel Store advice. Then click on Kate’s Amazon Shop for all her travel gear. Here is how to pack for Alaska. Going hiking, walking the Camino de Santiago? This is how to pack for walking or hiking trips. Tip 4: Planning means selecting good people to work with on your trip, and safe locations to visit. Tip 5: Never travel with your expensive jewelry or anything that you might miss if stolen. Tip 6: Don’t stuff your bag. Leave room to buy gifts, souvenirs, and presents for yourself. Tip 7: If you discover on the trip you overpacked, give something away. 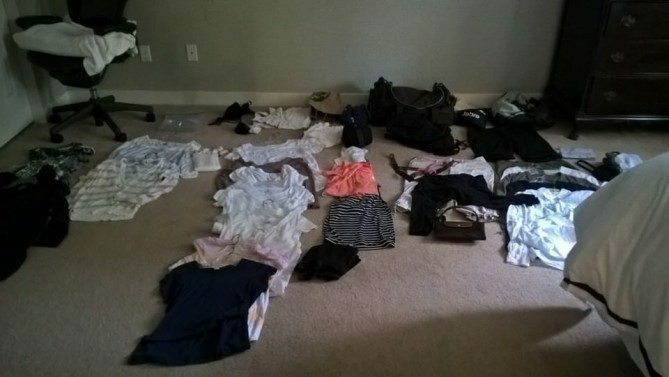 Don’t be afraid to discard or give away unwanted clothes when you are on the road. Tip 8: Lighten your load on the road by mailing items home if it becomes impractical to carry them any longer. Tip 9: Another idea is to buy your clothes while you are on your trip. People in the country will know where to get the most appropriate clothes for your location. Ask the locals for advice, if you find your clothes are uncomfortable. If you are uncomfortable in any way, ask for help from the local people. Tip 10: Remember you are carrying your bag. Carrying your bag is hard work, keep it light. Packing Light is the Travel Golden Rule. How I pack, yes, this is how I really do it. Full disclosure, I am a Windows OS person. I carry two smartphones with extra SIM cards. A universal calling plan and data plan on my phone from T-Mobile. Recently, I changed from Windows for travel because the Android apps are more reliable on a Samsung phone than my favorite Windows Phone. My Windows phone is my fav. Now I use my Windows phone as my office phone – and skip the apps. GSM works around the world, and in the USA. Sometimes my coverage is better abroad than in the USA. Travel tip: In case your phone gets stolen, know how to transfer your number to a new SIM and how to cancel an old SIM card. Learn how to move the SIM and cancel your card from your computer before you leave home. My phone is unlocked. I use GSM SIM cards on my phone. I buy local SIM cards with data in most countries for cheap local calls. Also, I use “What’s App” to call home and for them to call me, and it’s FREE. If you have great Packing Lists, I’d love to hear from you. Your comments are important to me; please share your tips. Please share your resources with us to help readers. We love improving and want to work and link to the best sites to help our readers.